The story of the great flood of 1913, forgotten by many, from the residents of the city it hit hardest. Archaeologist and children’s author Huey learned of the 1913 storm and its trail of destruction from the upper Midwest to New England from markings in an old factory in New York. 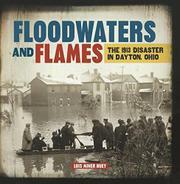 After a bit of research, she found that one city, Dayton, Ohio, was a symbol of the disaster to the whole nation at the time…and yet the modern general public knows little of Dayton’s trial by flood and fire. Continuing her research in Dayton, Huey discovered first-person accounts of the disaster and presents them in a narrative timeline. In the mingled voices of John Patterson, wealthy owner of National Cash Register, Orville and Katharine Wright, and librarian Mary Althoff, among other survivors, the story of the disaster plays out over three days in short sections devoted to each. Hobbled by a lack of information from Dayton’s poorer (and largely African-American) west side, Huey includes the heroic story of black baseball player Bill Sloan, who saved 300 from the rising waters in a commandeered canoe. A spot or two of confusing prose doesn’t mar this exciting account of the little-known disaster that helped spawn the Federal Emergency Management Agency.